Bear with me, my friends, because this Elite Blog Academy review is going to go very IN-DEPTH. It's not a quick read, but if you're anything like me, you probably want to know exactly what you're getting into before plunking down a hefty chunk of change on a blogging course. 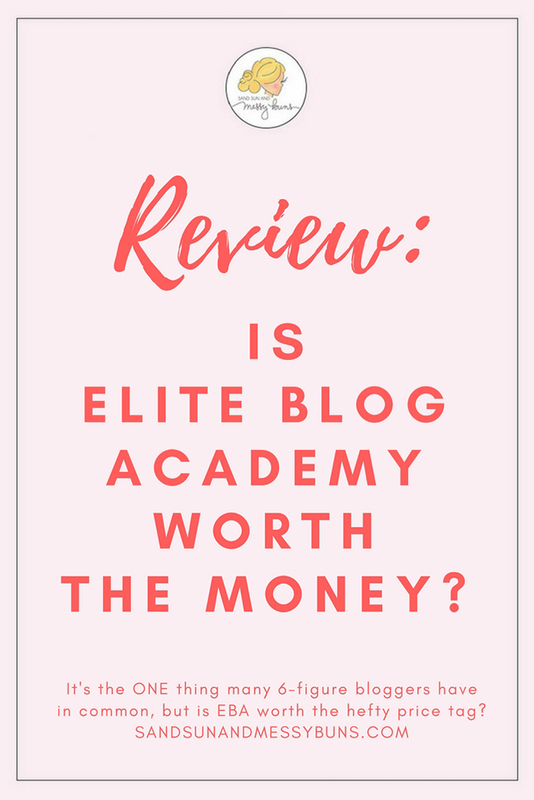 If you find this Elite Blog Academy Review helpful, please share this image on Pinterest. It's mentioned above, but I first want to make it clear that I'm an affiliate for Elite Blog Academy. In order to become an affiliate, I had to complete each of the 12 units — which means I know exactly what the course entails and how much work is involved in each unit. FYI: There's a LOT of work involved, but Ruth Soukup, the founder of Elite Blog Academy, has a knack for making each unit feel very doable. She structured the course so you work through it in very manageable steps. I have to start here, because there's nothing I love more than a good success story! Before EBA: Jennifer started a mom blog in September of 2016, and in her most profitable month prior to taking EBA she made $108 for the month. She couldn't afford her mortgage, considered selling her home, and had to charge Elite Blog Academy to her credit card in order to take the class. Her traffic has grown from 10,000 page views per month to 230,000 page views per month. Her email list has grown to 30,000+ subscribers in just one year. Learn more about Jennifer's success story here. Before EBA: Rosemarie was an exhausted stay-at-home mom who ran an in-home daycare and also worked 2 part-time jobs on the side. She started her blog and was making $18 per month in September of 2014 when she signed up for Elite Blog Academy. The last income report she publicly posted was in December of 2016. She made $91,464 that month. Her site's number of page views for December of 2016 was 365,898. See more of Rosemarie's success story here. Before EBA: Tasha started her blog in October of 2013 while she was working as a stressed-out partner in a law firm and defending medical professionals in multi-million dollar malpractice cases. She was also a mom to 3-year-old twin girls. Tasha enrolled in the first-ever Elite Blog Academy class in September of 2014. After EBA: 16 months after enrolling, Tasha gave up her partnership at the law firm to blog full time. Within a year of of signing up for EBA, she tripled her page views and was making $10,000 per month from her blog. As per her February 2018 monthly income report, Tasha made $31,346.73 (for the month). That income was primarily from sales of her downloadable product, Designer in a Binder. Hear more about Tasha's success story here. Before EBA: This husband and wife duo blogged for 3 months before they heard about and ultimately purchased Elite Blog Academy. As busy parents managing a household with 3 children, they were only able to make it through the first unit of EBA in one year. Their site brought in $30,000 the year they completed Elite Blog Academy and is on course to make 6-figures in 2018. The've been featured in major news outlets such as Entrepreneur magazine, ESSENCE, FOX News, USA Today, and Huffington Post. Their YouTube channel now has 50,000 subscribers and growing. Learn more about Talaat & Tai's success story here. Before EBA: Caroline was a teen mom who got pregnant at 18 and struggled to make ends meet. Her family of 5 was living on her husband's income of $17,000 a year before she discovered Elite Blog Academy. After EBA: Within 3 months of starting EBA, Caroline was making $1000 per month with her blog. Within a year of completing the course, her blog was bringing in $10,000 per month. She went from teen mom at 18 to CEO of a profitable and successful company before she turned 25. Check out more of Caroline's success story here. Before EBA: Before Elite Blog Academy our blog was a mess. We had no focus, we used photos we weren't even legally authorized to use, and we had very little clue about how to really earn a living from our blog. Her channel has more than 5 million minutes of watch time and over 2 million views! That means she has a lot of very loyal followers who watch the videos from start to finish. They even send private messages on Instagram asking when her next video will be posted! If you're like me and want to soak up every motivating detail possible, you can read more than 35 incredible success stories on Elite Blog Academy's testimonials page. The bad news is that Elite Blog Academy isn't right for everyone. I'm a tough love kind of girl, so this is where I'm going to be blunt with you: I'm not a fan of excuses. If you're the type of person who constantly makes excuses, then Elite Blog Academy probably isn't right for you. I suggest taking this free blog assessment quiz to see if you have what it takes to become a successful blogger. Until you learn to take charge of your own success and become an action-taker instead of an excuse-maker, then I truly do not think you should buy the course. This is a course you have to commit to 100%. Blogging for profit isn’t a hobby — it takes dedication and lots of work. If you're in that situation, you need to get in a better place financially before purchasing the course. It will take months of hard work and fully implementing the methods taught within the course before you begin bringing in a steady income. Elite Blog Academy is NOT a get rich quick scheme. Excuse 1.) It's Too Expensive. Elite Blog Academy does come with a rather hefty price tag. However, you'll receive lifetime access for the lifetime of the course with your purchase. My daughter is currently attending college, and the course costs less than the tuition for ONE of her classes this semester. That's crazy! In addition to lifetime access to any updates to the course, you'll also receive every bonus offered in each future version of the course, and you'll have unlimited access to the private EBA Facebook group — which is like having a tribe of blogging friends at your beck and call to help out whenever you're stuck. What's great about the Facebook group is that there are hundreds of members who are in the exact same blogging stage as you — no matter what stage you’re currently in! And everyone is super helpful and willing to jump in to answer questions. For example, you can ask a question about setting up a series of opt-ins on your site and you may have 10-15 other bloggers who are struggling with the same issue pop in to offer what has or hasn’t worked for them, and at the same time you'll also receive advice from 10-15 blogging pros who have been there/done that and know exactly how to solve the issue quickly. Elite Blog Academy also has a 100% money-back guarantee that gives you a full YEAR to test out the course. The Official Elite Blog Academy Refund Policy : No program works unless you do. If you’re expecting Elite Blog Academy®, or anything else to magically solve your problems or make you money the moment you register, please do NOT sign up. This is not some “get rich quick” program, nor do we offer some top-secret formula or magic bullet that promises untold riches with no effort on your part. Plus, we actually care that you complete and implement the material provided in the course. That’s why upon registering you must agree to complete the assignments. In order to be eligible for a refund you must submit your completed homework for all 36 assignments by 365 days from your start date. You can read the full details about requesting a refund by clicking on “policy” at the very bottom of the Elite Blog Academy sales page. If you’re just starting out as a new blogger and the course seems like a huge up-front investment, I’ll tell you why I recommend it: I wish more than anything that I’d invested in myself and learned how to blog the right way from the start! I wasted so much time and money correcting mistakes that could’ve been avoided in the first place if I hadn’t pieced together so much of my information from various self-proclaimed “experts” on the web. Ruth Soukup is a bonafide expert. Her EBA course has coached 10,000 students from all over the world. Many of those students have gone on to create 6 and 7-figure businesses, secure incredible book deals, receive national media coverage, and score major brand partnerships. EBA is the real deal. NOTE: Daisy & I only recommend products and services on this blog that we use and stand behind 100%. When we stop using something (like Bluehost), we remove it from our list of recommended products and delete any links to the product. Excuse 2.) I Don't Have the Time to Take It. OK, let's talk about that for a moment. I'm a single mom. I feel your pain. There just aren't enough hours in the day to do all the things. The beauty of blogging is that it isn't a race. You do not need to create the best blog in the world by tomorrow in order to win some type of imaginary “Super Awesome Person” award. What you DO need to do is to stay on course, focus, and concentrate on doing ONE thing every single day to work towards reaching your goals. Have you ever seen those psychological tests that rank the major stressors in life? The Holmes-Rahe Stress Indicator is a famous one. It lists major life changes, such as a death of a loved one, divorce, moving, personal illness, etc. Then it ranks each one with a corresponding stress number. The goal is to score 150 or under. A score of 150 – 300 implies a 50% risk of a major health breakdown in the next 2 years. A score over 300 implies an 80% chance of a major health breakdown in the next 2 years. My only child graduated from high school and moved out of state to attend college. During her first month there, the school was practically ground zero for Hurricane Matthew and she was forced to evacuate. She was out of touch for 5+ hours (cell tower problems) and school authorities had to contact the local police and hospitals to see if she'd been in an accident. She finally turned up safely — but in tears — near my parent's town, where they picked her up. I was diagnosed with hypothyroidism, which basically means my body is in a constant state of fatigue. I sold my house. Not once, not twice, but THREE times! The sale kept falling through at the very last minute, and I had to unpack everything and then re-stage the house again each time it happened. My dad and brother drove up from S.C. to help me move in. But as they were helping, my dad's pacemaker shocked him and we had to rush him to the ER. He was admitted, then his lungs filled with fluid and he was very touch-and-go for a while. I stayed with him in the hospital for a few days until he was released, then my brother and I drove him home to S.C.
Once I finally moved into the house, I began interior and exterior renovations. I had to replace an entire back wall that had rotted wood and moldy insulation, repair a bathroom that had a hole in the ceiling + a non-functioning tub, replace the roof + rotted support beams, have all of the original hardwood floors sanded + re-stained, and add 2 closets. After attempting to do too much of the renovation work myself (always trying to save a buck! lol The struggle of a single mom), I seriously injured my shoulder. Then Hurricane Irma reared her ugly head and Savannah went under mandatory evacuation orders (again), so Daisy and I hurricane-proofed the house and took off to stay with my parents for a week in S.C. Shortly after heading back to Savannah, Daisy's chameleon died. That was the first pet Daisy ever bought on her own, so I'm sure you can imagine the tears around our house. Adding insult to injury, it happened during the week of finals when Daisy was already stressed out. Just 2 weeks after that — on Thanksgiving Day — my dad passed away. Words cannot even begin to describe my sadness, so I won't attempt that here. All in all, it's been a very rough couple of years. But guess what? Even with all of that going on — plus working part-time as a marketing manager for a custom home builder — I still set aside time to work on this blog. NO EXCUSES. But for the most part — no matter how busy I was — I still made an effort to do ONE thing each day to help set our blog up for future growth and success. And that's the key to making Elite Blog Academy work. If you set the excuses aside, commit to spend 10 hours each week on the EBA course, and do ONE thing each day to move forward, then you have the attitude it takes to become a successful Elite Blog Academy student! Trust me when I say our blog is nowhere near where I want it to be right now. But when I look at everything that's happened over the past few years, I feel lucky to be alive and still kickin' it each day, and I'm grateful for the opportunity to improve the site and keep moving forward with it. This is where I have to point out that there is no magic formula to success — other than consistent hard work. Or as Ruth is fond of repeating: You have to DO the work. YOU have to do the work. You have to do the WORK. I compared it to purchasing a college course earlier in this post, and that's a good analogy here, too. You'll have worksheets and assignments to complete, just as you would in a college classroom. The GOOD news is that you can fully expect positive results if you put in the work and complete the course. What's In Elite Blog Academy? 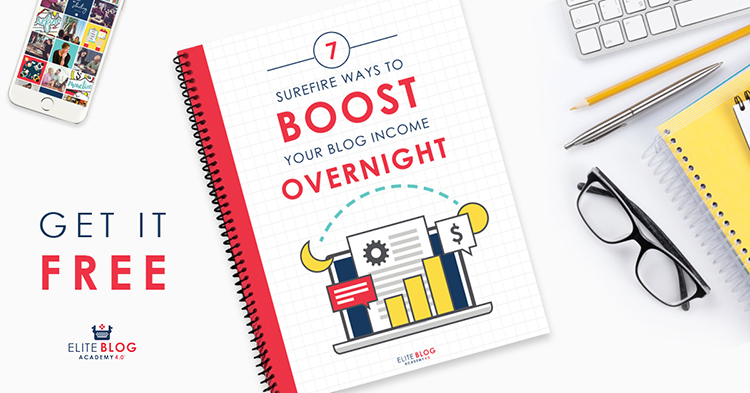 EBA contains a series of videos + printable PDF guides that teach you how to turn your blog into a profitable business. Each module of the course focuses on one specific aspect of blogging and teaches you how to master that section prior to moving on to the next. It’s set up this way specifically to ensure you have a good, solid foundation on which to build your blogging business. Our site's message was all over the place. It had no focus, and new readers couldn't even pinpoint what the site was about. I performed a user test where I invited strangers to visit our site, poke around, and then report their initial impressions. They weren't sure if we were operating a travel agency, an online clothing boutique, or what. Talk about a mixed message! Unit 4 is one of my personal favorites, because it's where you learn to optimize for search engine traffic (SEO). Before taking Elite Blog Academy, I'm embarrassed to admit I used the exact same keywords on multiple posts. I also used really broad terms that would never break the top 100 of Google search, and I taught Daisy to do the same. I made so many mistakes, simply because I didn't know any better! The keyword we used was “tan skin”. That term is very broad. (There are currently 22,000 searches per month for that specific 2-word phrase, according to Keywords Everywhere). The photos have no meta description and no ALT tag information. If someone tried to pin one of the photos from that post, the photo caption would simply show the post title and nothing more. Care to guess where that post shows up on Google Search? Honestly…I have no clue. I searched the first 25 pages of Google and got bored looking for it. No one (unless they are absolutely desperate for information) is going to dig deeper than the first few pages of Google Search…much less go past page 25 or 50!! I now know that SEO is a huge factor when it comes to ranking high in Google search! One key point I learned in Elite Blog Academy was to use longtail keywords. A long-tail keyword is more like a phrase vs. just a word or two. For example, on my popular travel post, The Ultimate Guide to River Street in Savannah, GA, I don't attempt to rank for the keyword “River Street”. That's what I used to do. Now that I know better, I attempt to rank for a longtail keyword phrase “what to do on River Street Savannah GA”, because that's a phrase people would actually type into the Google search bar if they were curious about what to do on River Street. When you optimize for longtail keywords, the results are incredible. Go ahead and search for any of the terms in quotation marks below, and tell me if one of our posts shows up on Page 1 of the Google Search results. Guys, page 1 is AWESOME. It means you don't have to pay for advertising. It means readers find your site organically by typing in a search term, and then Google sends them your way. We get more than a thousand visitors to our blog each week just from that River Street post alone. And it's a hard search term to rank for because every hotel and bar on River Street (plus the Savannah tourism board) are all competing for it. But you know what? I've never paid a single dime to Google to rank for that term!! Let that sink in for a second. We're competing with sites that have thousands of dollars in their advertising budgets, and our post organically ranks on Page 1. It's chock full of useful information that is relevant to the longtail keyword phrase. Everything about the post has been optimized using the exact methods learned in Elite Blog Academy. Our income was fairly non-existent when we started with EBA. Daisy's YouTube channel didn't have enough subscribers to be eligible for ads, and I'm pretty sure the only networks we belonged to were Commission Junction, Activate, and Shopstyle. We brought in under $100 per month in affiliate sales from those — and even that amount fluctuated significantly. Side Note: We each contributed to another website and got paid for doing so, but I wouldn't consider that to be money earned from this blog. It was more like a side hustle, and we used the money we earned to pay for things to help build this blog. Our site is currently monetized in a variety of ways. We use Google Adsense to monetize YouTube, numerous affiliate networks, we'll do sponsored posts if it involves a product we use and feel comfortable in endorsing, and we occasionally turn on ads — usually only on specific pages that are receiving particularly high amounts of traffic. Affiliate networking is our favorite way to bring in money, by far! Remember that blog post about River Street mentioned above? That post is monetized in the most basic of ways. Affiliate links are the most basic way to earn money on a site. I love them because they're not too “in your face”, and our site still looks very streamlined — even when posts contain multiple links. For example, all of the Elite Blog Academy links within this post are affiliate links. If you click on them and make a purchase, then we may receive a commission for referring you to the product. Side Note: It doesn't cost you anything! The cost for the program is the same whether you click through our link or not. The key to affiliate linking is to provide something extremely valuable for your reader. The readers visiting our River Street post are tourists who are planning to travel to Savannah for the first time, and they're doing research to make their trip better. What could a tourist purchase before a trip to make it more valuable? A map!! Therefore, I link to a map. And not just any map, but one that I love and have purchased myself many times over. (I give my copies away all the time because they're so helpful.) It's chock full of pertinent details about Savannah, and it's a very handy map to have when you're wandering around in the city. You'd probably be surprised to know how much money we've made off of that ONE map. Readers click on it, purchase the map, and then fill their cart with other essentials they need from Amazon. We then make a commission on their purchase for referring them to Amazon to shop. July 2018 Update: I've removed the links to the map because I'm creating my own product instead! September 2018 Update: I now have my own product! Thanks to the advice I received in Elite Blog Academy, I created the Savannah First-Timer's Guide, and it's the best decision I've made so far in the entire course! This post is getting insanely long, so I'll summarize briefly and say Unit 11 was my favorite part of this module. It includes a section where Daisy and I had to write our mission statement. We're passionate about championing causes that benefit women, so as part of our mission we donate a portion of our proceeds to these charitable causes that are important to us. It’s worth the cost — IF you’re willing to put in the work and if you're in a financially stable place. Only you can decide whether or not you're at that point. Remember, though — the course has a 100% Money Back Guarantee. However, you still have to put in the work in order to qualify for the refund. My personal opinion of Elite Blog Academy is that it's the best investment I've made in our site thus far. I haven't discovered any course as comprehensive as Ruth's for the price. It's even more valuable once you add in all the bonuses you get with EBA! I fully recommend it if you are financially stable and are willing to put in the work to complete the program. I do NOT fully recommend it if you are not currently in a financially stable place — especially if you have other people depending on you in order to live. Don't hang your hopes and dreams on a blog and what it might do for you when you could instead be putting your precious time and effort into getting a guaranteed daily paycheck, feeding your family, and building up your savings account. Once you feel you are on more solid ground financially, I would at that time recommend that you purchase Elite Blog Academy. Thoughts? Questions? Hit me with 'em! Have I given you a case of information overload? Do you still have questions? You can see everything Elite Blog Academy has to offer on this page, including info on the different packages. The course is “officially” only open for sale ONE TIME each year, and that always occurs the first week of March. However, “unofficially” they do open it up for sales a few other times during the year. If you get on the wait list, they'll email to let you know about the secret sale dates. One usually occurs around November. If you still have questions about whether or not Elite Blog Academy is right for you, feel free to email me at [email protected], and I'll be happy to help you work through it! I love the success stories. I was looking into Elite Blog Academy and seeing people who have done it before is inspirational! Happy it helped! It’s a great course. Very comprehensive for bloggers who want to take it to the next level. Thank you thank you thank you so much for this! I haven’t seen a review as in-depth as this one. I really want to make investments in blog courses, but I’m still trying to figure out which ones would be good for me. Financially, this is definitely not something I can do right now, but it 100% is something I’d like to invest in in the future. Thank you for you unbiased review. This is something I have considered and I love that it is a lifetime program.